This weekend we had plans to do some more exploring around the southern Ruahines, but bailed out a day early with too much snow for the gear we’d brought, not to mention an extended mountain forecast of 120km/h gale-force nor-westerlies in exposed mountain areas on Sunday. Okay, the forecast was general enough to be for the entire North Island, but if there’s a particular kind of wind the Ruahines are very exposed to, it’s nor-westerlies. Location: Ruahine Forest Park, Petersons Road (Heritage). People: Bernie, Richard, Mike L and me. 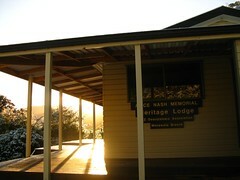 Huts visited: Heritage Hut (1 night) — aka Alice Nash Memorial Heritage Lodge. Intended route: In via Heritage Lodge, head up Tunupo, around Toka and down to Leon Kinvig Hut, maybe poking down to Toka Biv on the way for a look. Then we’d have a long Sunday, looping up over Te Pohatu, past Longview, over Pohangina Saddle and back to Tunupo before dropping back down to Heritage. 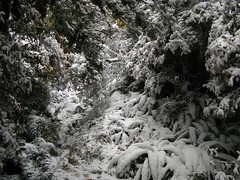 Actual route: Most of the way up Tunupo, then we turned around due to uncertain conditions and possibly unsuitable gear. Our original idea was to go in via Heritage Lodge, head up Tunupo, around Toka and down to Leon Kinvig Hut, maybe poking down to Toka Biv on the way for a look. Then we’d have a long Sunday, looping up over Te Pohatu, past Longview, over Pohangina Saddle and back to Tunupo before dropping back down to Heritage. Actually, before the original plan we’d wanted to do a crossing trip, but we couldn’t find anyone to drive to the far side and switch vehicles with us. Friday evening had a mixed bag of weather. I was lightly hailed on during my walk to our Wellington railway station, and I learned later that was the beginning of one of those extreme sudden cold snaps that leaves as quickly as it shows up. (The previous one of these was smack in the middle of my wedding rehearsal, which I remember being very interesting.) We must have avoided the full force of it as we drove north, but were being well and truly snowed on as we drove into the parking area half an hour from Heritage Lodge. Welcome to spring! The snow was falling nicely during our 2 km walk to Heritage Lodge, which did more than I thought it would to reduce the effectiveness of torchlight. (I’ve not walked much through falling snow in the dark, but I suppose this is normal.) There was an interesting array of footprints in the fresh snow, too, including over the arch bridge that crosses Umutoi Creek… but I’m not enough of a hunting geek to know what the animal was. Nobody was home at the lodge, which made it easier for us to sort ourselves out without bothering people, and I think everyone was asleep by roughly 11pm, for a 6.45am wake-up. We woke up to a clear blue sky over blanket of snow, and with the sun beginning to lift above the horizon, surrounding trees were noisy and dripping with ongoing morning snow-melt. Bernie, shortly after we left. Despite the early rising time (for me), we had a lazy start and didn’t properly get going until about a quarter past eight… not a concern as Saturday was likely to be a short day, anyway. The climb from Heritage Lodge is stretched out enough so that an 850 metre climb isn’t too steep. 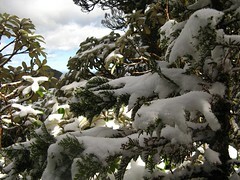 The temporary surroundings of the morning made it very nice, coasting gradually upwards through the snow-covered forest, at first being rained on by snow-melt in the trees. 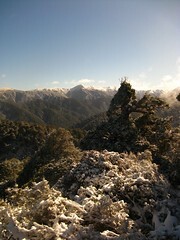 We reached the open bush-line shortly before 10am, and could finally look over the snow-capped ridge-lines, notably Mangahuia (1583m) in the distance across the far side of the range, and (I think) Maungamahue (1641m) further back as we climbed even higher. 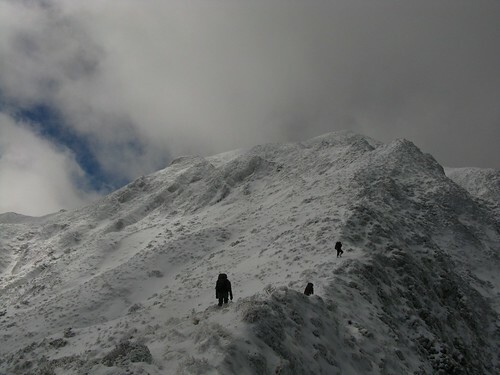 Ahead of us loomed Tunupo (1563m), which was very definitely blanketed in snow. Looming weather became clearer, too, with darker clouds starting to wisp over the range, bringing with them light but freezing wind. From forecasts on Friday night, we knew things could pack in further later this afternoon, too, as well as tomorrow, and a thought in the back of my own mind was the possibility of getting stuck in place like Leon Kinvig Hut for longer than we wanted. The hut itself is in a valley, but getting out without going over tops seemed impractical. Mike L on the way down. Therefore, when we started striking harder snow and were beginning to kick steps here and there, we had a chat and made a decision to turn around. I think it was partly because we didn’t know where the conditions were going, and weren’t perfectly equipped at the time for such conditions. (I’d certainly have felt more comfy with an ice-axe, that’s for sure.) I think we’d have been fine getting up and along the ridge-line, at least based on the nearby snow, but for me it was also the next day’s forecast that was putting me off. 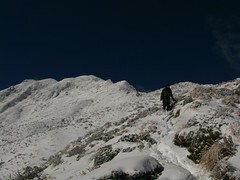 Maybe it was overly pessimistic of me to think so in some ways, but sometimes it’s difficult to gauge, and to be honest the thought of clambering along crusty snow on Ruahine ridge in gale-force 120km/h nor-westerlies without ice axes and crampons didn’t appeal to me. I’ve been in that kind of wind in the Ruahines enough to know that I’d rather avoid it. So, at 1480 metres (roughly 90 vertical metres below Tunupo, which was by then shrouded in dark grey cloud) we turned around, and had a nice walk back towards Heritage Lodge. Before long we’d removed however many storm layers we’d added to keep off the wind, but still had some surreal early-spring unmelted-snowy surroundings for nearly the entire distance down. We were still able to make the most of what was a nice sunny day in the valleys, and on the way down decided to just head out to the road and leave a day early, rather than spend another night at Heritage Lodge. Sitting in the pub at Apiti — the small town with a golf club membership comprised of hundreds of Aucklanders (something about cheaper entrance to golf courses in Auckland) — I still think we’d made the right decision. There are some good pub meals in Apiti, by the way. We sat around the table playing a game of “name the next Ruahine hut that nobody’s mentioned yet”. Even more surreal than the walk down through the snow was hearing on the way home first that Christchurch had been hit by a 7.1 magnitude Earthquake (astonishingly not killing anyone as a direct consequence as we eventually discovered but still causing extensive damage to the city and its infrastructure), and secondly that New Zealand suffered its worst air disaster in 17 years. 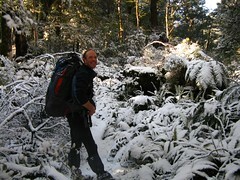 This entry was posted in tramping and tagged bagged:heritage hut, change of plans, ruahines, snow, tramping, wellington tramping and mountaineering club, wtmc newsletter. Bookmark the permalink. Wow. Nice pics of the snow – that’s quite a dump to see it down so low. Yep, here’s something similar to what you’ve described, although on that occasion we’d walked along from Howletts earlier that morning and it was in summer conditions. From the notes I wrote (for which times tend to base on photo timestamps) it took roughly 2 hours from spot-height 1519 to (the one that’s not Otumore) to Tunupo. That was a reasonable sized group of people, but as groups go it wasn’t an especially slow group of people. From Tunupo it was another couple of hours down, which is fairly consistent with how things went last weekend, albeit from a little below the top most recently (but with snow around). Hi Mike – great thanks for the link through to that trip. Another one really keen to do (again in warmer climes) is Purity/Waterfall/Waikamaka/Waipawa Saddle/Te Atuaoparapara/Sunrise – and from reading your trip reports for (Purity/Pourangaki/Kelly) and (Waterfall via Tussock) – this looks like it would be a ripper – just need to sort transport – one can’t dismiss the benefits of loop trips….. Any way – this is a fantastic blogg – Choice 1. Oooh, you’ll have a great time. Turning back on Tunupo was very wise. I did a similar trip the other day. At Heritage Lodge, the weather was calm, and mid-summer sweltering. On the ridge heading to the spur down to Iron Gate Hut, it was blowing a gale, and cold cold cold. I wouldn’t want to try it in marginal conditions. Hi Fraser. Yes I’ve noticed the Ruahines can be like that. Not a cloud in the sky and brilliantly sunny in the valleys, yet it can be blowing a gale in the exposed places on the top and very dangerous. It seems to be one of the characteristic differences from the Tararuas one step further south, probably because they’re further inland and just that little bit higher. Cheers.